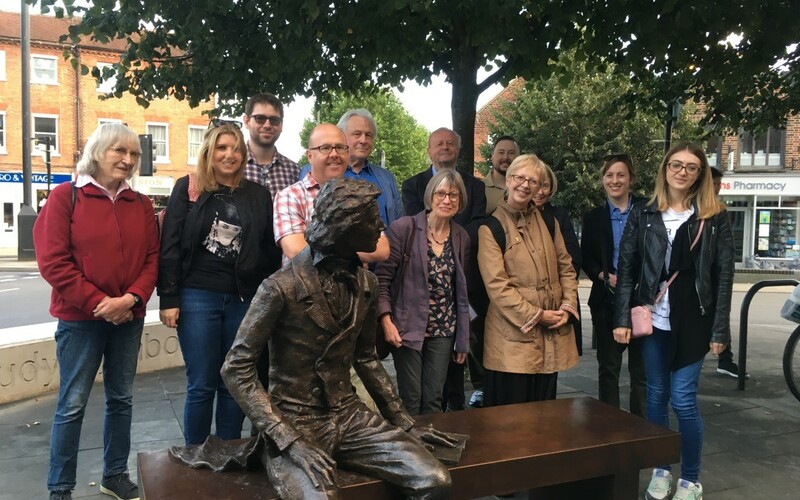 After much anticipation a statue to the poet John Keats has been unveiled in the centre of the city! The poet visited Chichester in January 1819, staying with the parents of his friend, Charles Dilke in Eastgate Square. So it is fitting that the sculpture depicts John Keats relaxing on a bench looking up towards the city centre and cathedral – the inspiration for his epic poem, The Eve of St Agnes which he began during his stay. Vincent Gray, the sculptor had long had the vision for just such a work and his passion and desire to bring this to fruition was finally rewarded with its unveiling by Dame Patricia Routledge at the end of August 2017. Vincent has really brought Keats alive – it is easy to sit beside him and ponder on what life was really like in Chichester at the beginning of the 19th Century.